Front Row: (L-R) Milica McMillen & Prentice Basten (Breck), Paige Hailey (Red Wing), Sara Carlson (Hutchinson), Amanda Arbogast (Eveleth-Gilbert); Back Row: Kayla Gardner, Layla Marvin, Karley Sylvester, Shelby Amsley-Benzie (Warroad), Abbie Wisneskie, Sam LaShomb and Katie Felton (South St. Paul). 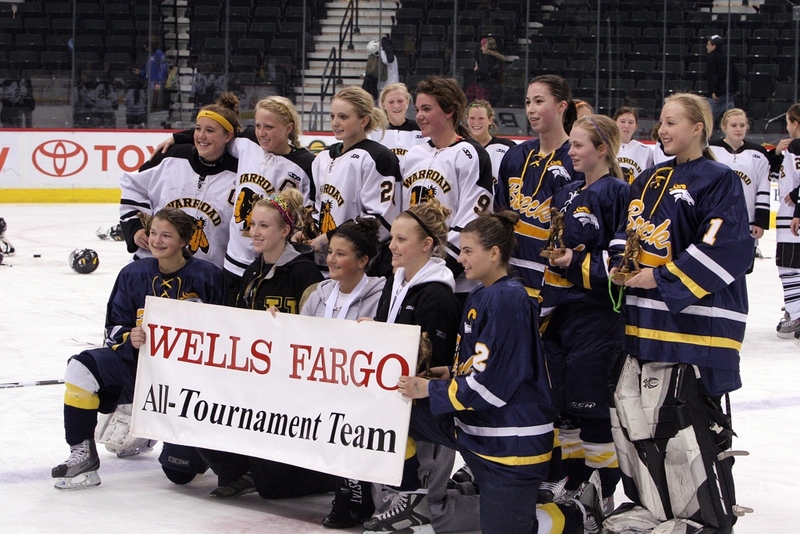 The State Class A All-Tournament Team was announced immediately after Warroad’s 5-1 win over South St. Paul and Breck’s Milica McMillen and Prentice Basten were chosen for the 2011 team. For Milica, it was the third time she has been selected on the team. She was also chosen in 2008 and in 2010. The Mustangs beat Eveleth-Gilbert 6-4 to win the State Tourney Third Place Trophy this morning. Breck had juggled their lines in the early going with seniors Kayla Mork and Caroline Griffith joining junior Carly Schaeder for the opening face-off. Schaeder and Griffith were still together on the ice when they set-up Milica McMillen for her 20th goal of the season. The Mustangs were totally controlling the puck when junior Prentice Basten scored to make the score 2-0 and the shots on goal 9-0. But then Breck started taking penalties and giving away power play opportunities. After Breck skated off the first part of a 5-on-3 power play for Eveleth, the Golden Bears scored a power play goal to narrow the score to 2-1. Prentice Basten added her second goal of the day and her fifth of the tournament on a Breck power play as the period ended with the score 3-1 and shots on goal now even at 11-11. Kayla Mork created excitement for the Mustangs with a shorthanded goal to give Breck a 4-1 lead at 14:34 of the second period. But the excitement was short lived, as Eveleth came back fast scoring three times in 73 seconds to tie the game at 4-4. The Golden Bears scored twice in the second period’s final minute, the second goal with 4 seconds left was scored just six seconds after a Mustang penalty. Nine seconds into the final period, Breck took another penalty and the Golden Bears scored twenty four seconds later for the 4-4 tie. The Mustangs needed to take charge again and Breck’s Milica McMillen started the comeback with her 21st goal of the season and 110th of her career, tying Ellen Swiontkowski for first on Breck’s all-time goal scoring chart. Breck nursed the 5-4 lead, by controlling the puck and staying out of the penalty box until Carly Schaeder scored with six minutes left to give the Mustangs a 6-4 lead. Breck kept the Golden Bears bottled up in their zone in the closing minutes, keeping so much pressure on goaltender Vicky Fossland, that Eveleth was never able to pull her for an extra attacker. Junior goaltender Taylor Neisen collected her 18th win of the year to set a new single season record for victories eclipsing Courtney Nygaard’s 17 wins during the 2007-2008 season. She also extended her record for saves in a season to 781, as the Mustangs allowed a record 856 shots on goal in their 31 games this season (previous record 808 by the 2002-2003 Mustangs in 25 games). The Mustangs lost 1-0 to South St. Paul on a third period power play goal in the State Tourney this afternoon. Breck moves onto the Third Place game at 9:00 AM tomorrow at the Xcel Energy Center. The Mustangs were bottled up in the early going as the Packer 1-2-2 fore check kept the play in the Mustang zone much more than expected. The first period ended with South St. Paul leading on shots on goal by a 13-4 advantage. The second period was much more even with Breck getting several close in scoring chances where passes to the crease just missed. The Packers benefitted from two 5-on-3 opportunities and used their power play time to record a 12-9 shots on goal advantage for the period. The third period was much more up & down the ice. The opportunities kept coming for both teams and it was hard to believe the score was still 0-0 with all the chances the two teams had. With 7:14 left in regulation, Breck took a tripping penalty and 30 seconds later senior Ali Chula picked up a loose puck just outside the crease and flicked in the game’s only goal on the power play. The Mustangs continued to play hard trying to get the tying goal. After a coast-to-coast rush, Kate Schipper hit the inside of the right post and the puck ricocheted across the goal mouth and to the left boards. After pulling Taylor Neisen for an extra attacker with 77 seconds left, Breck had two scrambles in front of the Packer goal, but could not beat senior Katie Felton who made 26 saves for her seventh shutout of the season. Breck’s Taylor Neisen was awesome in goal for Breck, making 39 saves, frequently making two or three saves at a time as the Packers would capture a rebound and try to hammer home a goal. Neisen broke the Breck record for saves in a season during the second period. Taylor now has 754 saves heading into tomorrow’s third place game. The previous personal and team record was 729 saves by Amanda Rosequist in the 2004-2005 season, a season which saw Rosequist play every second of every game on the way to a 13-12-2 record for the Mustangs. Remember, tomorrow’s third place game is NOT on TV or on the internet, so head off to the Xcel to watch in person as seniors Kayla Mork, Caroline Griffith and Jillian Husband play their final game for the Mustangs. Breck advances to a semifinal game on Friday morning at 11 AM with South St. Paul, a 5-2 winner over Hutchinson. The Mustangs out skated, out hustled and out played the Bears in a thrilling 5-1 victory over the #2-ranked Bears on Thursday evening. The Bears got on the board first with a long range shot from just inside the blue line by Abby Lund. But Breck’s top line had been buzzing the net and it was just a matter of time before senior Kayla Mork scored off a pass from Carly Schaeder to tie the score at 1-1. Breck had a 12-9 shot advantage in the period. The Bears pushed hard during the first half of the second period pressuring the Breck zone but that started to change when Milica McMillen picked up a loss puck and carried into the Blake zone and sent a swift backhand shot passed Chloe Billadeau for a 2-1 lead at 8:21. Just three minutes later McMillen blasted a shot from the blue line that Kayla Mork tipped past Billadeau for a 3-1 lead. With the Mustangs continuing to work hard and pass the puck, Carly Schaeder collected a loose puck in the right corner of the Blake zone and she waited as Karina Marette broke in on goal and then Carly delivered a perfect pass to the goal mouth timed to Marette’s charge for a 4-1 lead at the second intermission. Breck had scored on three of their six shots in the period. The first goal of the third period was going to be huge. If Blake scores, it’s 4-2 and the comeback is on; if Breck scores its 5-1 and Blake would need to start taking chances and give up even more scoring opportunities. For the Mustangs they continued skating hard, using their fore check to keep the Bears in their zone and good things happened when Kayla Mork found Kate Schipper in front for goal number Five and a Four-goal lead. The next 8-10 minutes of the third period saw Blake taking chances trying to crash the Breck net, which started the Mustangs out of their zone on a lot of odd man rushes. The final four minutes of the game, Blake was killing penalties while the Mustangs were content to play keep away with the puck to keep the clock ticking down to the 5-1 final and the Section 5 Championship. The Mustangs dominated the period with a 13-10 shot advantage aided by 4 minutes on the power play. 1st Period: BLAKE - Lund (Cameranesi, Ahn) 2:59. BRECK – Mork-13 (Schaeder-23) 7:21. 2nd Period: BRECK – McMillen-18 (unassisted) 8:21. BRECK – Mork-14 (McMillen-18) 11:09. BRECK – Marette-12 (Schaeder-24) 13:47. It is Déjà vu as the Minnesota State High School League’s Class A state tourney bracket has the exact same four upper bracket teams in identical positions as the 2010 tournament. Breck plays New Ulm (11 AM Wednesday) and South St. Paul plays Hutchinson (1 PM) with the two winners meeting in the semi-finals. Warroad is the overall #1 seed and the Warriors face Alexandria (6 PM) in the opening round with Eveleth-Gilbert facing Red Wing in the (8 PM) final opening round matchup. 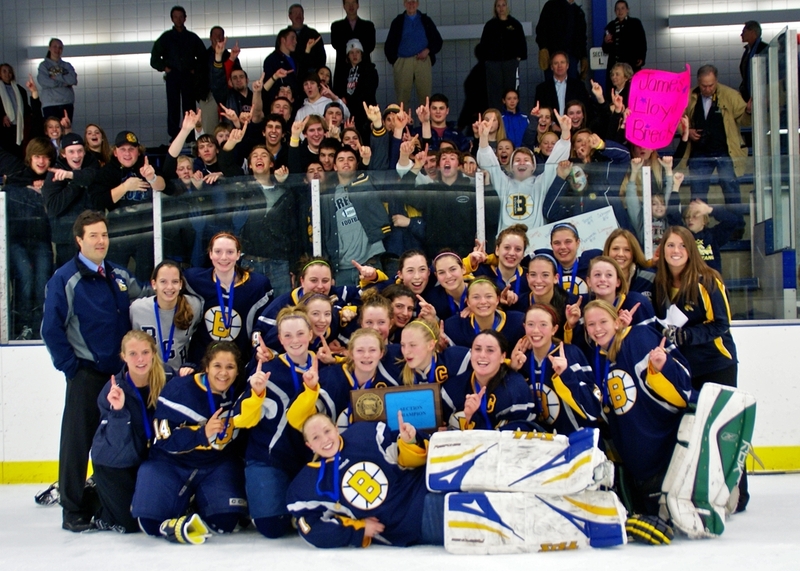 he Breck Girls Hockey web site has been updated to include the 28 games so far in the 2010-2011 season, http://www.breckgirlshockey.com/. With her next goal, Milica McMillen will move into a 2nd place tie in Breck goal scoring at 108 goals with Susannah Brokl and she is just 3 goals behind Ellen Swiontkowski’s 110. Hopefully, she can become the Mustangs’ all-time goal scorer on her way to leading Breck to their first Minnesota Class A State Girls Hockey Championship. The Mustangs came back from a 2-1 first period deficit to score 5 consecutive goals for a convincing 6-2 win over Mound-Westonka on Tuesday evening. Junior Milica McMillen had two goals and two assists for Breck, while senior Kayla Mork had two goals and an assist to move into fourth-place on the Breck all-time scoring chart with 137 points (66 g, 71 a), one point ahead of Madison Styrbicki who finished her career in 2009 with 53 goals and 83 assists for 136 points. McMillen’s first goal was scored after she jumped over a Mound player’s outstretched stick and snapped home the tying goal. Milica’s second goal came after she had served a penalty and came out of the box to join the play as a forward, Jillian Husband hit her with a long pass and Milica tripled deke and dangled through one defenseman then gave the goaltender a final double deke and ripped a shot into the net off the top cross bar to score. Breck Advances to the Section Finals on Thursday evening at 7:30 PM at Parade versus The Blake School. The Mustangs beat the St. Louis Park Orioles 8-1 in the first round of the Section 5 Playoffs as Milica McMillen had her fifth career hat trick and Kate Schipper had a goal and an assist to reach the 100 mark on career points (51 goals and 49 assists). Breck (14-11-1) advances to the second semifinal game at 7:30 PM on Tuesday at Parade Ice Garden where they will play Mound-Westonka (20-6-0), an 8-0 winner over Richfield. The first semifinal game on Tuesday at 5:30 PM pits #5-seed Orono (17-7-1) versus #1-seed Blake (17-4-4). Breck 2010 graduate Emily Kleidon leads the Trinity Bantams to Minnesota on Friday, January 14 and Saturday, January 15 to play Gustavus Adolphus on Friday (7 PM) in St. Peter and St. Thomas on Saturday (5 PM) in Mendota Heights. If you haven’t seen a Women’s College Hockey game, this is the perfect time to see one of the Best teams from the East play two of the Best teams from the West. 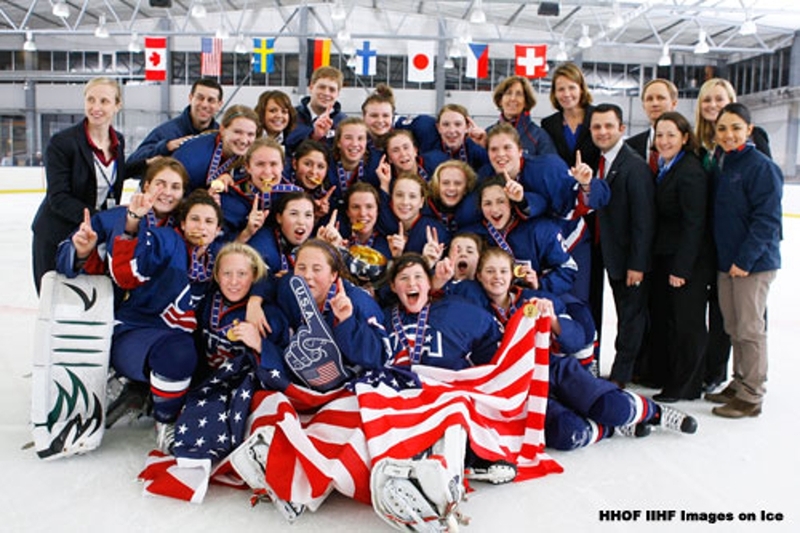 TEAM USA won the World Championship today in the 2011 18U International Ice Hockey Federation Tournament. Breck’s Milica McMillen was named the tournament’s top defender. Milica scored the fifth and final goal in the 5-2 win over Canada this evening. 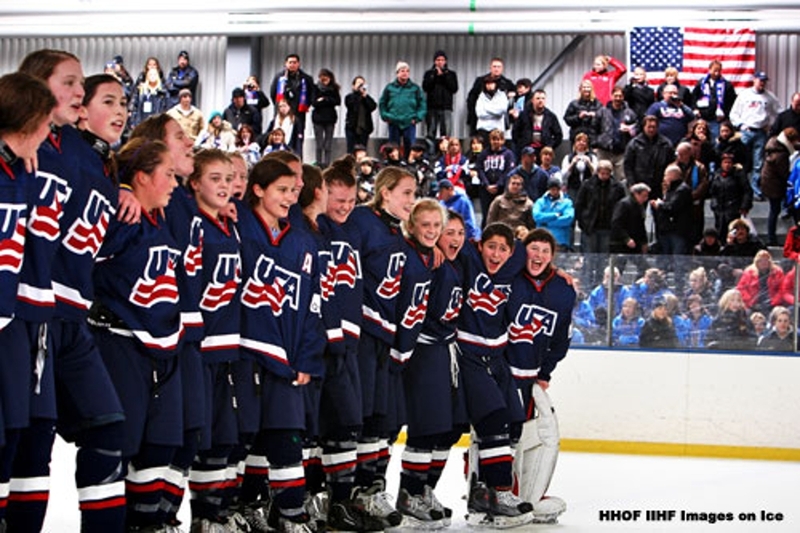 Team USA sings the national anthem after winning the gold medal. Milica McMillen has two goals and is plus-4 so far for Team USA in the World U18 tournament in Stockholm Sweden. Team USA has advanced to the semifinals with a 3-0 record as the winner of their division. Canada is also undefeated and is seeded into the other semifinal game. USA plays the Czech Republic which won a quarterfinal game 3-1 over Germany. Canada will play the winner of the Sweden-Finland game later today. USA has won by lopsided margins so far with wins: 11-0 over Czech Republic, 7-1 over Japan, & 10-0 over Sweden. Their game time for Friday has not been determined. The games are on a live stream on the internet. The Sweden-Finland game starts at Wednesday Noon our time: http://web.lemonwhale.com/api/swehockey/swehockeyplay.html . The Mustangs exploded for 7 first period goals on their way to a 13-1 win over the Minneapolis Novas on Saturday afternoon. Kate Schipper had four goals and 2 assists, while Kayla Mork had three goals and an assist. Eighth-grader Megan Sweet scored her first career Breck goal to open the scoring. Breck plays their final regular season game on Tuesday, Fe. 11th @ 7:00pm versus Minnetonka at Pagel Arena. The Mustangs came back from a 3-1 deficit to tie Blake 4-4 on Thursday evening. Breck scored three straight goals in a three minute stretch of the third period to take the lead at 4-3. During the furious third period rally at the Bear Den, Breck outshot the Bears 21-9. Milica McMillen scored twice for Breck, tallying her 100th and 101st career goals. Also scoring for Breck were senior Caroline Griffith and junior Karina Marette. The tie gives Blake the Tri-Metro Conference championship with an 8-0-2 record. Breck is now 7-1-1 and the Mustangs can finish with an 8-1-1 record if they can beat Minneapolis on Saturday in their Senior Day home finale at 1 PM. The Mustangs beat the Duluth Northern Stars 4-1 on Tuesday as Taylor Neisen made 30 saves for Breck. Junior Milica McMillen got the Mustangs going with a breakaway shorthanded goal to tie the score at 1-1 midway through the first period. Milica’s goal was her 99th as a Mustang and her 200th point of her career. Five minutes later, Prentice Basten scored her sixth goal in the past 6 games to give Breck the lead. Then senior co-captain Kayla Mork scored just thirty-four seconds later to give Breck a comfortable 3-1 lead at the first intermission. Junior Kate Schipper finished the scoring with a quick unassisted score after a third period face-off in the Duluth zone. Breck’s next game is Thursday against Blake at Blake Arena at 7:30 PM. The Mustangs have their final home game on Saturday versus the Minneapolis Novas. They will celebrate Senior Day for senior co-captains Kayla Mork, Caroline Griffith and Jillian Husband, game time is 1:00 PM. The Mustangs continued with their first period scoring splurge on Tuesday at Drake Arena, beating St. Paul United 5-1. Breck scored three times on their first four shots to knock out United’s starting goaltender. Milica’s McMillen scored her ninth goal of the season and the 98th of her career to open the scoring. Just 47 seconds later, Carly Schaeder scored her 11th goal of the season assisted by Caroline Griffith and Natalie Roberts. Then following the ensuing face-off, Caroline Griffith scored ten seconds later on assists by Schaeder and Leah Schwartzman. Eighth-grader Leah Schwartzman scored Breck’s fourth first period goal in the final minute of the period. Taylor Neisen made 28 solid saves in goal to earn the win, while newcomer Prentice Basten added her fifth goal in the last five games. The archrival Blake Bears beat the Mustangs 4-1 for their 28th win in the teams’ 35-game series, Breck is now 5-28-2 versus Blake. The Mustangs got off to an early 1-0 lead after junior Milica McMillen intercepted a Blake pass and took off on a breakaway. Bears’ goaltender Chloe Billadeau made the save on Milica, but the rebound bounced out to Carly Schaeder who scored at the 4:03 mark. Breck dominated the period controlling the puck, out shooting the Bears 16-8, but they couldn’t make it past the period’s final minute as Blake’s Hillary Crowe scored at 16:03 to tie the score 1-1. Breck was poised to take the lead with a power play advantage at the five minute mark of the second period but a crossing pass at the point was fanned on and Blake’s Abby Lund grabbed the puck and took off on a breakaway for Blake’s second goal. Blake added two more goals in the period, one on a power play and the other on a breakaway. With the win, Blake regained first place in the conference with a 6-0-1 record to Breck’s 6-1-0 record. Breck’s next game is against St. Paul United on Tuesday at Drake Arena. The Mustangs beat the St. Paul Blades 5-1 on Thursday evening. Junior Prentice Basten scored two goals just 23 seconds apart in the first period to put the Mustangs in control, then she scored again in the third period to record the 48th hat trick in Breck Girls Hockey history. Karina Marette and Milica McMillen also added goals while Carly Schaeder had 3 assists. Taylor Neisen made 18 saves for the win in goal for the Mustangs who took over first place in the Tri-Metro with the win. Breck is now 6-0-0, with Blake in second with a 5-0-1 conference record. The two teams will face off for first place on Saturday at Breck Arena, game time is 1 PM. The Mustangs beat the St. Paul Blades 4-1 on Tuesday afternoon. Junior Milica McMillen scored two goals to break the Breck Girls Hockey All-Time Scoring record with her 192nd and 193rd points. The record was set at 192 points by Ellen Swiontkowski (110 g, 82 a) during the 2007-2008 season. Milica now has totaled 96 goals and 97 assists in her five Mustang seasons. The Breck faithful were glad to see the return to action of Kayla Mork. Kayla scored Breck’s second goal, unassisted. Taylor Neisen got the win in goal for the Mustangs. Taylor lost her shutout bid with 2:15 left in the game. The Mustangs lost 4-3 in a non-conference game with Hill-Murray on Saturday afternoon. The Mustangs’ Kate Schipper scored midway through the first on an assist by Carly Schaeder to put Breck up 1-0. Hill-Murray came back strong with Hannah Brandt scoring twice late in the period for a 2-1 Hill lead. 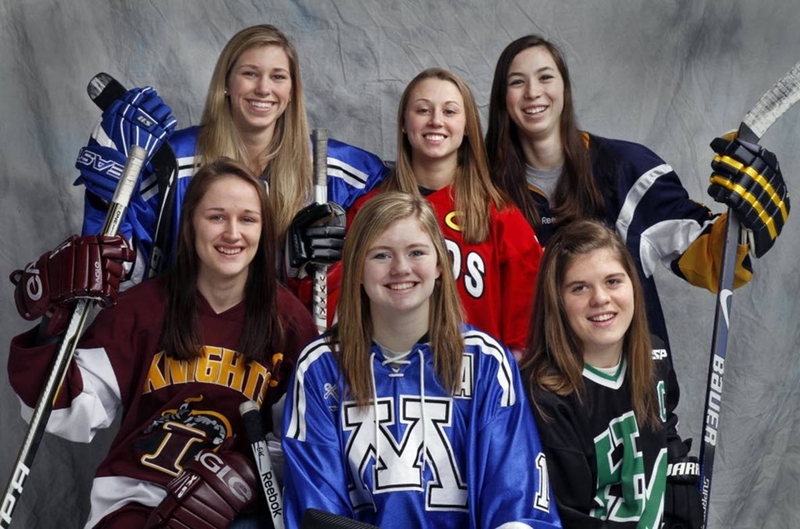 Hannah Brandt was a member of Team USA in the U18 World Championships with Milica McMillen and is already committed to join the University of Minnesota Women’s team with Milica in September 2012. Junior Prentice Basten scored a shorthanded goal for Breck on a breakaway to tie the game at 2-2. It was Prentice’s first career goal for Breck and it came in her first varsity game. Hill-Murray scored the next two goals to go up 4-2, as Hannah Brandt completed her fourth hat trick of the season. Breck’s Claire Mancheski scored the game’s final goal with 96 seconds to go to allow the Mustangs the opportunity to pull goaltender Taylor Neisen in the last minute for an extra attacker. Breck swept the season series with Minnehaha this evening with their second 4-1 win of the year over the Saints. Sophomore Kate Schipper scored the 48th hat trick in Breck Girls Hockey history by scoring three goals in six minutes and 25 seconds midway through the first period. It was Kate’s second career hat trick. Carly Schaeder scored the other Breck goal while Karina Marette added two assists. The Mustangs beat the Minneapolis Novas 5-1 this afternoon to stay undefeated in the Tri-Metro Conference with a 3-0 record. Eighth-grader Claire Mancheski scored the 47th hat trick in Breck Girls Hockey history and the seventh hat trick* for an 8th grader. Claire also added an assist on sophomore Kate Schipper’s first goal. Kate had two goals and added an assist, while eighth-graders Megan Sweet and Isabel Gleekel each got their first Breck career points on assists on Mancheski’s last two goals. Junior Taylor Neisen made 11 saves for the win in goal for the Mustangs. The Mustangs lost 6-2 to the #5-ranked AA Lakeville South Cougars on Friday evening. Lakeville dominated the second and third periods as the Cougars outshot Breck 38-16 on the evening. Lakeville’s Morgan Fritz-Ward had her second hat trick in her last 3 games while line mate Samantha Moore had four assists. Breck’s goals were both on the power play with Karina Marette scoring the first goal of the game and Kate Schipper scoring the game’s last goal. Breck’s next game is Saturday at Parade Ice Garden versus the Minneapolis Novas (4-10-0, 0-1-0) at 3 PM. The Mustangs stormed back from a 1-0 deficit to beat St. Paul United 3-1 on Thursday evening. Breck played without stars Kayla Mork (injury) and Milica McMillen (Team USA). The Mustangs comeback was started late in the second period by the penalty killing duo of Kate Schipper and Carly Schaeder who intercepted a United pass and broke out on a 2-on-0 breakaway resulting in Schipper’s shorthanded goal to tie the game 1-1. United was 0-for-5 on the power play and Breck’s penalty kill created more scoring chances than they gave up. Breck junior Karina Marette intercepted a pass in the slot midway through the third period and stuffed the puck past goaltender Cory Russell for the game winner. United pulled Russell with 75 seconds left for an extra attacker and 8th-grader Leah Schwartzman scored on a 170-foot shot for the 3-1 final margin. Taylor Neisen made 23 saves in goal for Breck as the Mustangs improved to 2-0 in Tri-Metro Conference Play and 6-7-0 on the season. St. Paul United dropped to 1-2-0 in conference and 4-10-1 overall. The Mustangs beat Eveleth-Gilbert 4-1 in the Schwan Cup Consolation Championship game on Wednesday evening. Sophomore Kate Schipper scored twice for Breck, while Carly Schaeder had the game winning goal and an assist. Junior Taylor Neisen made 22 saves in goal for the Mustangs to earn her fifth win this season. The Mustangs beat the Silver Bay Mariners 4-3 this afternoon to advance to the Schwan Cup-Blue Division Consolation Championship game on Wednesday versus Eveleth-Gilbert (9-6-0). Junior Carly Schaeder scored two third period goals to lead Breck to victory. Carly also assisted on eighth-grader Alexandra Wallin’s first career Breck goal in the first period. Schaeder’s second goal was an empty netter which appeared to be an insurance goal at 16:41 until Silver Bay scored with four seconds left to make the final 4-3. Junior Karina Marette had a goal and an assist for the Mustangs while sophomore Kate Schipper tallied two assists. Goaltender Taylor Neisen made 19 saves for the win in nets for Breck. The Mustangs lost 3-1 to the Fargo North Spartans on Monday afternoon. Breck now plays Silver Bay (6-4-1) in the consolation bracket at 1:30 PM on Tuesday at the Super Rink. Silver Bay lost 5-3 to Red Wing in the Blue Division’s opening game. Senior co-captain Kayla Mork made her return to the team after recuperating from a shoulder separation suffered in the Edina game on November 27. Kayla scored the only Breck goal midway through the first period assisted by junior Carly Schaeder. Junior Aimee Bala tied the score for Fargo with her first goal of the year early in the second period. Senior defender Taylor Brenneman gave Fargo the lead during a 4-on-4 shift halfway through the third period. Breck pulled goaltender Taylor Neisen with just over two and a half minutes left for an extra attacker and Fargo sophomore Samantha Hagen was able to score an empty net goal for the final 3-1 score. 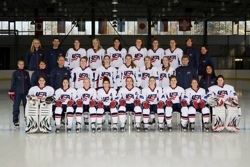 Breck played without Milica McMillen, who is playing for the USA U18 team in Sweden during the holidays. Milica’s consecutive game streak of 126 games came to an end just 20 games short of the Breck Mustang record of 146 consecutive games by Susannah Brokl (six seasons, 1997-2003). Recent grad Madison Styrbicki is second on the consecutive game list with 140 games over five seasons, 2004-2009. The Mustangs snapped their six-game losing streak by beating the Minnehaha Saints 4-1 in their Tri-Metro Conference opener. Eighth-grader Leah Schwartzman scored her first two goals for the Mustangs to get Breck out to a 2-0 lead. Carly Schaeder and Karina Marette also scored for the Mustangs. Breck played again without Kayla Mork (injury) and Kate Schipper (illness). Goaltender Taylor Neisen made 22 saves for the win. Breck junior Milica McMillen was selected to represent the United States on the U.S. Women’s Under-18 Select Team that will compete in Sweden January 1 through January 8, 2011. McMillen will join the USA team in Blaine on December 26 for practices prior to the team’s departure. She will miss six Breck games during her sabbatical starting with the Schwan’s Cup, December 27-29. The Mustangs 2-0 lost to Proctor/Hermantown/Duluth Marshall on Friday evening. For Breck, it was the first time the Mustangs had been shutout since a 4-0 loss to Minnetonka on December 30, 2008, a team record span of 51 consecutive games with a goal. Only two Breck teams have played an entire season without being shutout. The 2001-2002 squad was the first to score in every game while going 6-15-3 with 55 goals in 24 games. 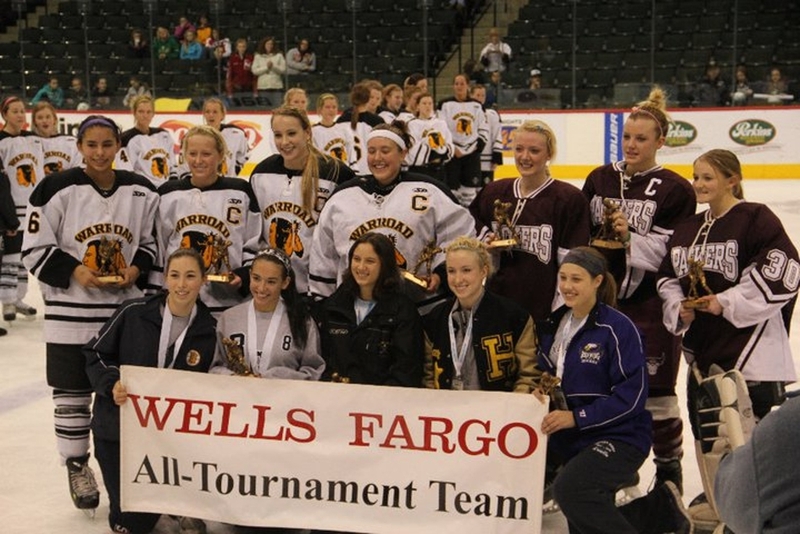 The 2009-2010 State Runner-Up squad was the second to accomplish the feat with 136 goals in 30 games with a record of 25-4-1. The Mustangs (2-6, 0-0) will open their Tri-Metro Conference season at 3 PM this afternoon with a home game against the Minnehaha Saints (3-6-1, 0-2-0). The Mustangs lost 4-3 to the St. Croix Valley Fusion on Thursday evening. Breck scored their first first period goal of the year when Caroline Griffith scored off a scramble in front of the net before goalie Kalli Armagost could cover to give the Mustangs a 1-0 lead. Eighth-grader Leah Schwartzman got her first career assist on Griffith’s goal. Breck almost doubled their lead when the Mustangs had a 2-on-0 breakaway three minutes later, but the puck was shot wide and the opportunity was gone. The Fusion’s Tara Frey tied the game just before the end of the period. Milica McMillen scored on a breakaway early in the second period to give Breck a 2-1 lead. Karina Marette assisted Milica on the rush with a long outlet pass to the Fusion blue line. The Fusion came right back with a goal of their own on a play where a shot from the point was tipped wide to senior defender Nikki Plunkett who had half the net open from 10 feet out and she buried it to tie the game 2-2. At one point in the second period, the Mustangs held a 14-10 lead in shots, but the Fusion took over control of the puck for the remainder of the game outshooting Breck 26-6 over the game’s last 30 minutes. The Fusion’s leading scorer, Hailey Rock, scored twice midway through the third period to give the Fusion a 4-2 lead. The Mustangs were able to close to 4-3 as Milica McMillen took off with the puck on a penalty kill and scored on a 1-on-4 situation as she weaved in, out and back in on net to beat 4 defenders for a shorthanded goal. The Mustangs pulled Taylor Neisen with a minute to go in an attempt to tie it with an extra attacker but they were thwarted by the Fusion’s defense. Breck was playing without injured stars Kayla Mork and Kate Schipper. The Mustangs’ next game is their Tri-Metro Conference opener at Aldrich Arena versus the St. Paul Blades (4-2-1, 1-1-0) on Saturday evening at 8 PM. The Blades have beaten the Minneapolis Novas and lost to Blake in conference games. The Mustangs suffered their fourth straight loss on Saturday, this time at the hands of Chaska/Chanhassen by a 3-1 score. Breck played with several junior varsity players playing in place of injured seniors Kayla Mork and Caroline Griffith. Breck’s lone goal was scored on a rebound by junior Kate Schipper. Rosemount senior Allison Micheletti scored with 45 seconds left to give Rosemount a 3-2 win over the Mustangs on Thursday evening. The Mustangs tied the score twice but never led during the game. Carly Schaeder scored at the 11:29 mark of the second period to make it 1-1, but Rosemount’s top scorer Rachael Kelly scored her second goal of the game just 19 seconds later to put the Irish back on top. Midway through the third period, Milica McMillen scored an unassisted, shorthanded goal to tie it at 2-2 and set the stage for Micheletti’s game winner. Rosemount outshot the Mustangs 20-6 in the third period and 46-22 for the game. The Mustangs lost 3-1 to the Edina Hornets on Saturday. The Hornets outshot Breck by a 40-18 margin and took a 3-0 lead before Breck junior Karina Marette scored a power play midway through the third period. In the Cake Eater tourney championship game, Blake and Benilde skated to a 3-3 tie forcing a shootout for the championship trophy. The Bears came away with the trophy as Blake senior Abbie Lund scored a shootout goal and senior goalie Chloe Billadeau stopped all three Red Knight attempts. The Mustangs lost a 3-2 OT heartbreaker to Benilde on Friday night. Just about the time the Breck faithful were thinking about who coach Vannelli would chose for the tie-breaking shoot-out, the Red Knights ended the game with a goal with just 9.4 seconds left. Freshman Ali Praus scored on a wrap around to send the Red Knights into the championship game against the Blake Bears, who beat Edina 4-3. The Mustangs Kate Schipper tied the game at 1-1 late in the second period. Eighth-grader Claire Mancheski scored her first career goal early in the third period to send it into OT. Hello citizens, students, faculty, family, friends, and neighbors in Minnesota .KMSTP Fox 9 News will be featuring the Minnesota Cake Eater Classic sponsored by the Edina Hockey Association. The Tournament will be held this Friday November 26th, and This Saturday November 27th at Braemer Arena in Edina. The Cake Eater Classic will feature High School Girls Hockey Teams from the following schools; Edina High School, Benilde St. Margaret’s, Blake, and Breck. If you would like to check the tournament schedule of the game please go tohttp://www.edinahockeyassociation.com/page/show/245970-cake-eaters-info. Also the games will be streamed live on our website at http://www.foxpreps.com/subindex/hockey or on demand if you missed it. Fox Preps Hockey is a great way for parents, friends, and family to check out the game. 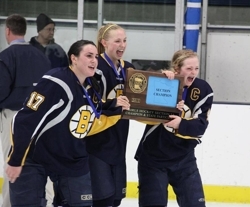 You can check out stats, rosters, HS Hockey standings of their own school versus competitors, and also catch up on some great pictures of the team and their devoted fans. Make sure you check out our website all weekend long! Hope to see everybody out at the games this Friday and Saturday. The Mustangs stormed back from a 4-0 deficit with less than 10 minutes remaining in regulation to win 5-4 in OT over the Mound-Westonka White Hawks on Thursday evening. Kayla Mork’s game winning goal with 49 seconds left in OT completed her fourth career hat trick. Kayla also scored Breck’s first and third goals. Milica McMillen and Kate Schipper both had a goal and three assists during the rally. The Mustangs third and fourth goals were each scored with the goaltender pulled for an extra attacker. Kate Schipper’s game tying goal came with just 10 seconds left. 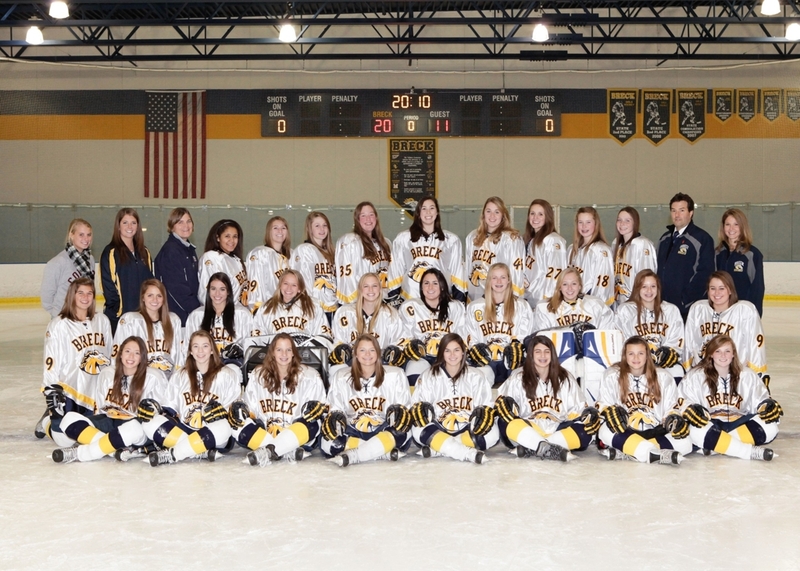 Breck’s next game is Friday, November 26 at the Edina Cakeeater Tourney. The Mustangs play Benilde-St. Margaret’s at 6 PM at Braemar Arena. The Breck Mustangs scored 3 straight goals late in the third period to overcome a 4-2 deficit and beat the Farmington Tigers 5-4. It was Breck’s third win over the Tigers breaking a six-game losing streak to Farmington which dated all the way back to January 12, 1996, when Breck won 4-0 behind a shutout from Dish Sinaiko and two goals from Genny Furst and single goals from Liz Scaterella and Meade McCarthy. The Mustangs fell behind 2-0 giving up a pair of power play goals to Farmington’s senior captain Krystal Baumann. The efficiency of the Tiger power play was awesome as they scored faster than Chelen Johnson could announce the offense and perpetrator. Breck’s Carly Schaeder tallied a power play goal for the Mustangs to make it 2-1, before Baumann broke out on a 3-on-1 with two linemates and beat Breck’s Taylor Neisen on a breakaway for her hat trick. The Mustangs came out focused for the third period as they were on a carryover power play from the second period. Shortly after the penalty expired, senior co-captain Caroline Griffith banged in a loose puck after a fanned shot by eighth-grader Alexandra Wallin to make it 3-2 Farmington. The Tigers drew another Breck penalty just minutes later and Baumann notched her fourth goal of the game on an extreme hustle play to extend Farmington’s lead to 4-2. 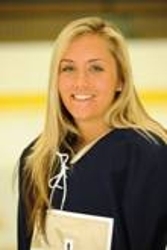 The heroics for Breck were started by junior Milica McMillen, who calmly collected an offensive zone draw, stepped towards her right and flicked a shot high to the goaltender’s stick side and in. Carly Schaeder scored her second goal of the game just three minutes later, high to the goaltender’s stick side and in to tie it at 4-all. Then just 29 seconds later, Katie Schipper scored off a 2-1 break where the defender covered Mork, leaving Schipper to goaltender Jessica Erchul and Schipper scored high to the goaltender’s stick side and in. Farmington’s Jessica Erchul had displayed an awesome glove side in the first two periods as she gobbled up shots by Schipper, Mork, McMillen and others. 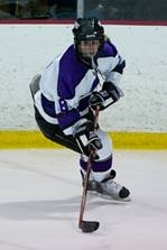 Thankfully, the Mustangs started shooting for her stick side and pulled out a victory to open the 2010-2011 season. The Mustangs lost 3-1 to Warroad in the MSHSL Class A State Championship game. Breck played valiantly throughout the game and took a 1-0 lead into the third period but Warroad scored at the three minute mark to tie the game and then scored the game winner with just 67 seconds left on a long pass and breakaway. The final margin was created after Breck pulled their goaltender for an extra attacker and Warroad was able to hit the empty net with a long shot. Head coach Lenny Vannelli started his five seniors for the game’s opening face-off: Emily Kleidon, Grace Orlady, Mikki Johnson, Hayley Opperman and Christine Brodersen. Breck placed five players on the Class A All-Tournament Team: Kayla Mork, Kate Schipper, Milica McMillen, Hayley Opperman and Taylor Neisen.